The Woodhaven Residents' Block Association is thrilled about the plans to reopen the Forest Park Carousel this summer. For over three years, the WRBA has fought to make the carousel operational again. These efforts have taken a variety of forms, including working with our elected representatives, writing letters to city officials, petitioning, organizing rallies of support in-person and online, publicizing the cause in the media, and even creating a popular "Save the Forest Park Carousel" t-shirt. Now, the New York City Department of Parks and Recreation has found a concessionaire to operate the carousel, overcoming the major obstacle that has kept this Woodhaven antique behind locked fences for far too long. 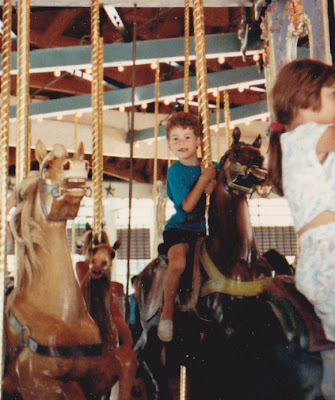 riding the Forest Park Carousel as a 5-year-old in 1989. "The carousel is part of our community's identity. We couldn't be happier that the Parks Department has done the right thing—something we've requested for years—and gotten a deal done so that our community can enjoy it again," said WRBA President Edward K. Wendell. "The ride is a beautiful work of art, a historic specimen that embodies our community's heritage, and a form of entertainment that has amused generations of Woodhaven residents. We're overjoyed to have it back." The Forest Park Carousel features a colorful menagerie of horses, tigers, and lions, including some of the last creations hand-carved by artist Daniel Carl Muller over a century ago. It is also decorated with beautiful paintings depicting settings in Woodhaven and the rest of Queens. "For a long time, I've said that our carousel is the jewel of Forest Park and a treasure that deserves better than the treatment it has received the last few years. Finally, we have a concessionaire who promises to restore it to its former glory," said Maria Thomson, executive director of the Greater Woodhaven Development Corporation. "This is a real victory—not just for the people of Woodhaven, but for all of New York City. Our Forest Park Carousel is back for everyone to enjoy." New York Carousel Entertainment LLC will operate both the Forest Park Carousel and the Flushing Meadows-Corona Park Carousel, according to news reports. Woodhaven's carousel is expected to be running again by Memorial Day. The Block Association supports New York Carousel Entertainment's stewardship of the carousel, and encourages the company to work with the community to preserve the ride and make it an attraction once again.